This week in my mail I was surprised to find a postcard from France. 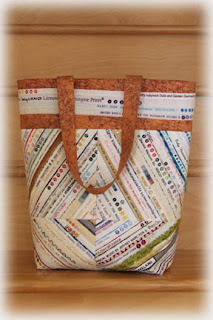 It was sent by Sandra Reford, who curated the Canadian exhibit at Carrefour Europeen du Patchwork. It was such a thoughtful move on her part; she doesn't skimp on any of the details. I am so happy to have this souvenir. Aren't the houses beautiful? I expect they've been translated into patchwork many, many times. I've also heard from several folks who attended the show in Ste. 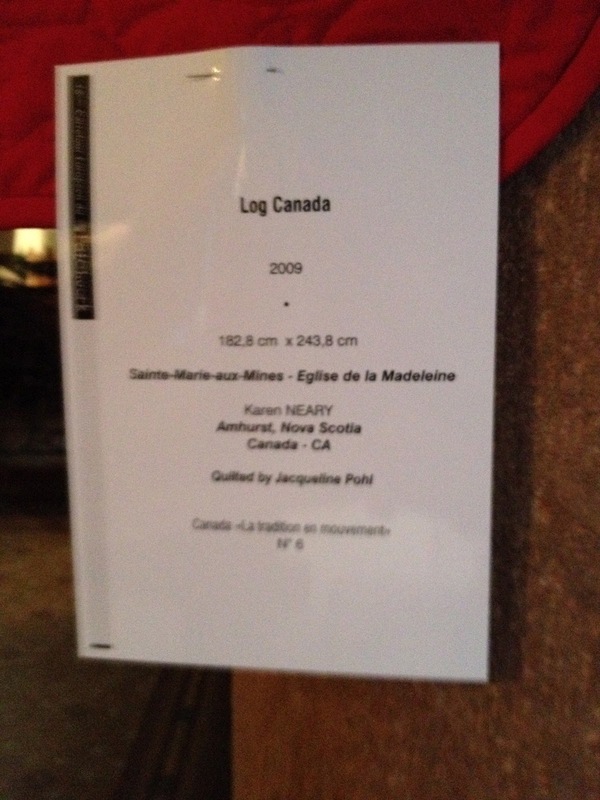 Marie-Aux-Mines, and even got some pictures. These were sent by Karen Otto's friend Diane. Karen, who lives in Germany, was kind enough to email me after the show with her wonderful, enthusiastic comments. Thank you, Karen - I appreciated hearing from you. This is a picture Sandra sent along showing Log Canada hanging between two pillars at the front of the church. Sandra writes, "It was on the right when you came in as an announcement that this was the Canadian exhibit... In front of it was a table with a map showing where all the works came from, flyers with all the web sites of the artists, the photo album, another hand out with images of the works in miniature with the names of the artists and the comment book which will be arriving back with the quilts. I only had time to read the comments from the first day and those were great!" Sandra had an incredibly busy time at the show, and she wowed everyone with her ability to converse in four languages. What a perfect person to curate an international exhibit. This picture was taken by magazine editor Chantal Dupont. You can see Log Canada at the back of the picture, to the left. 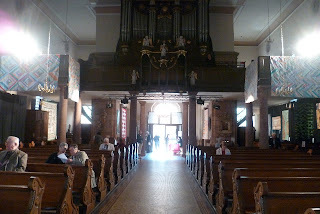 The picture was taken when the gallery was closed for mass on Sunday morning. Sandra reports that the quilts are now all safely back in Canada and she is preparing for their upcoming exhibit at the Joshua Creek Heritage Centre in November. Even though there hasn't been opportunity to blog about the summer much, hubby and I did do some tripping around, including around the south shore of Nova Scotia. One of our goals was to see the Bluenose II being rebuilt in Lunenburg. These pictures were taken in early August. Now the work is finished and Nova Scotia’s sailing ambassador, the Bluenose II, is headed back to the water. 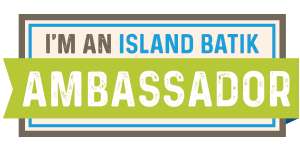 Tomorrow - Sept. 29 -you can visit Lunenburg to witness the relaunch of this provincial icon. There will also be a live feed showing the launch and some of the day's entertainment. The relaunch begins at 7 a.m., and the celebration will continue throughout the day and into the evening with three concert stages ending with a burst of fireworks. We won't have a chance to go, but I will be watching online. One of the highlights will be hearing Michael Stanbury's The Bluenose Song, which was performed for the July 24, 1963 launch of the Bluenose II. You can read more in the article from The Halifax Chronicle Herald, and listen to this recording of the song from many year's back. Who sail her smartly into victory. And they sailed her masterfully till she died. 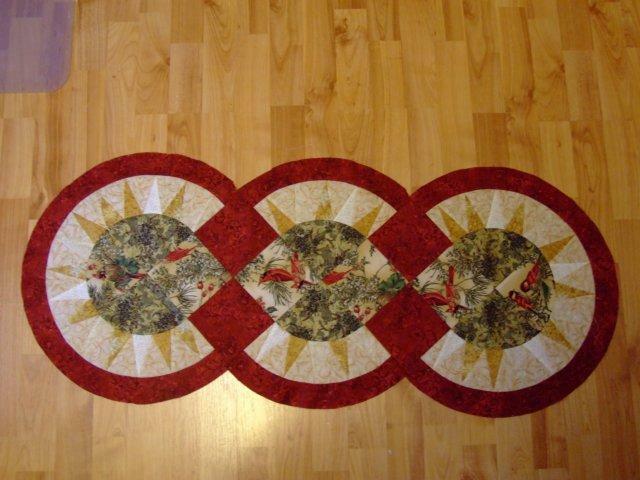 It was a good day of sewing, and the Roundabout Again variation went together beautifully. My plan in making this was to take it with me for my demonstration at dayle's during Fibre Arts Festival. 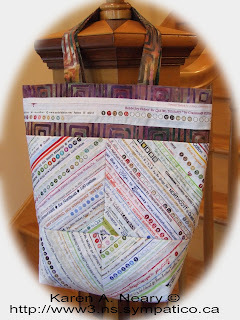 I figured I would take my Bernina and show how I machine quilt a piece like this. However...this is really beckoning me to keep going and finish. 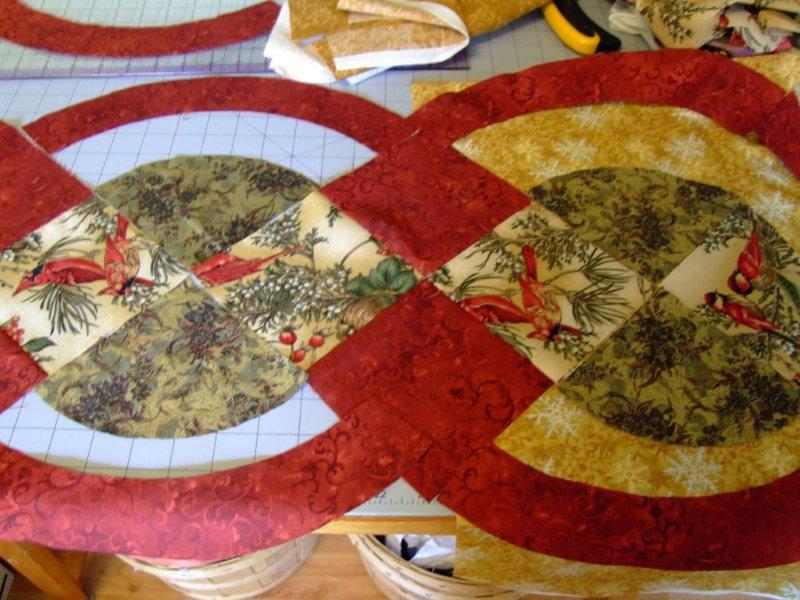 I'm going to have to show real restraint not to finish this before the festival starts...I am itching to quilt bows on those red squares. I think that will look festive! The pattern (# 112 Roundabout Again) is here if you'd like to make your own. 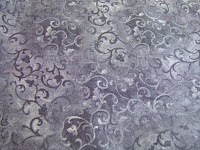 This morning on a trip to dayle's to drop off some patterns, I spotted this gorgeous black print. 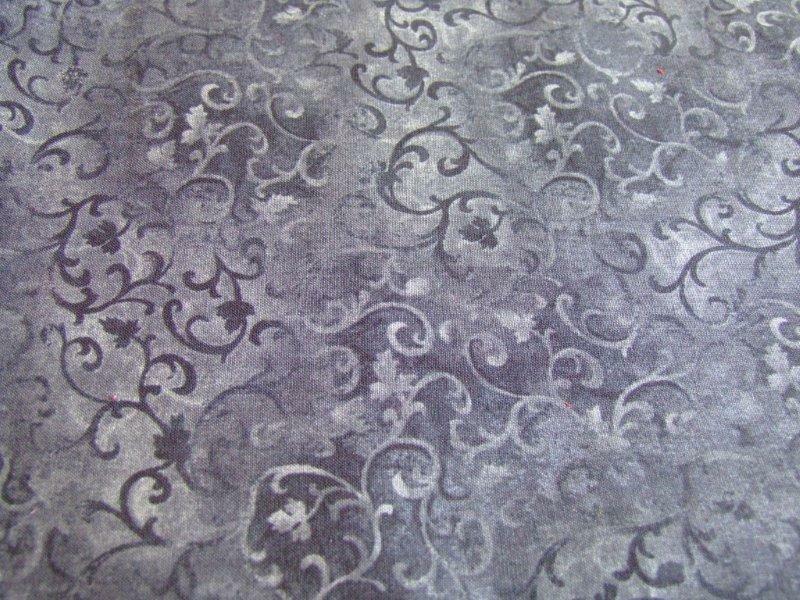 Granted, it doesn't look so gorgeous in this picture, but trust me...it is. They also had it in red and green; all three colourways were equally stunning. I couldn't resist and came home with a couple of metres of the black with no project in mind, but just to have. I petted and admired it as I worked away, all the while hearing this little voice whispering, "really, Karen? They had it in red and you bought BLACK?" So we all know I trotted back down to dayle's to get that red. This morning are pictures on Sandra Reford's blog showing the quilts being hung for the show in France. Above you can see Log Canada spread out on the pews with some of the others waiting their turn to go up. Sandra reports that there was a line-up for the doors to open and over 1000 visitors to this exhibit on the first day. 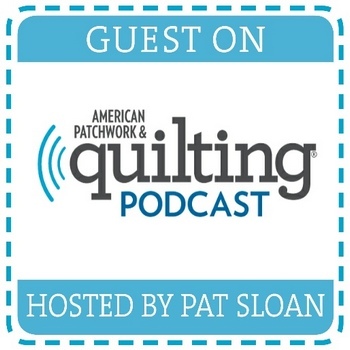 She also presented a lecture on "Quilting in Canada" which was well attended and enthusiastically received. I had hoped to wake up this morning in France...but it didn't happen. 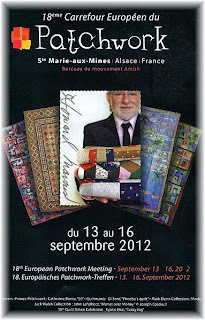 Carrefour Europeen du Patchwork opens today in the Alsace region and my Log Canada quilt went without me to the show. Following is the press release on the Canadian "Tradition in Transition" exhibit, curated by Sandra Reford. 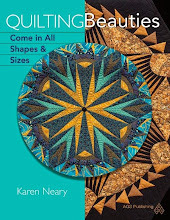 Sandra has promised to post lots of pictures on her blog, so I am looking forward with great anticipation to see my quilt hanging in this prestigious exhibit. 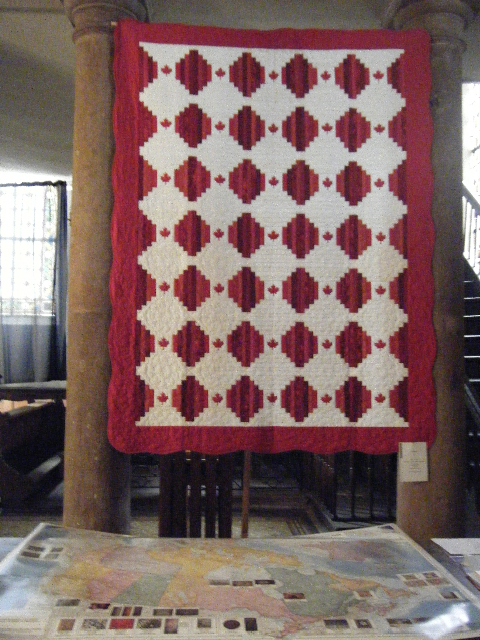 Européen du Patchwork and will be exhibiting in L'Église de la Madeleine. International award winning textile artist and quilter, Sandra Reford, was asked to curate a body of work that is of an exceptional technical standard and that represents the current state of quilting and textile art in her country, Canada. The Canadian exhibit is just one of many in the carrefour. The event organizers are expecting 22,000 visitors to grace the Val D'Argent area this September. 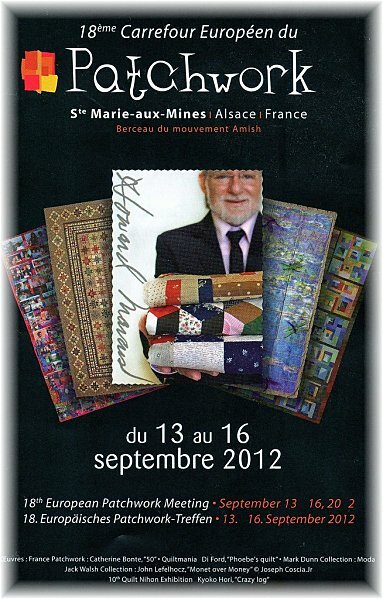 Visitors will be exposed to the European perspective on patchwork and textile art while enjoying the Alsatian culture. The exhibit, Tradition in Transition, will reflect the diversity of styles and characteristics of the Canadian creators and regions from which they come. It will be for many of the artists their first opportunity to exhibit on an international stage. 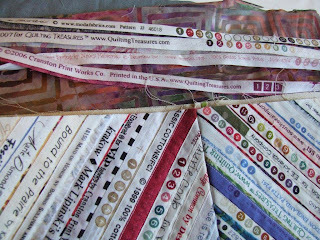 I found a piece of batik in my stash that works great with the varied selvedge strips: browns/greens/rosy plums/tans. I chose long selvedge strips with similar colours for the band around the top. 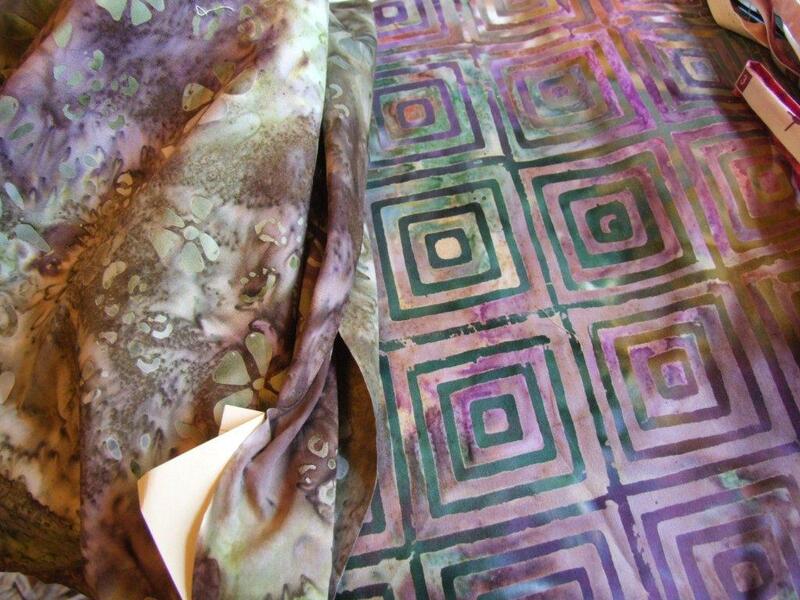 Another floral batik in my stash with the same colour palette is perfect for the lining. The batiks are both by Benartex, and work well together. 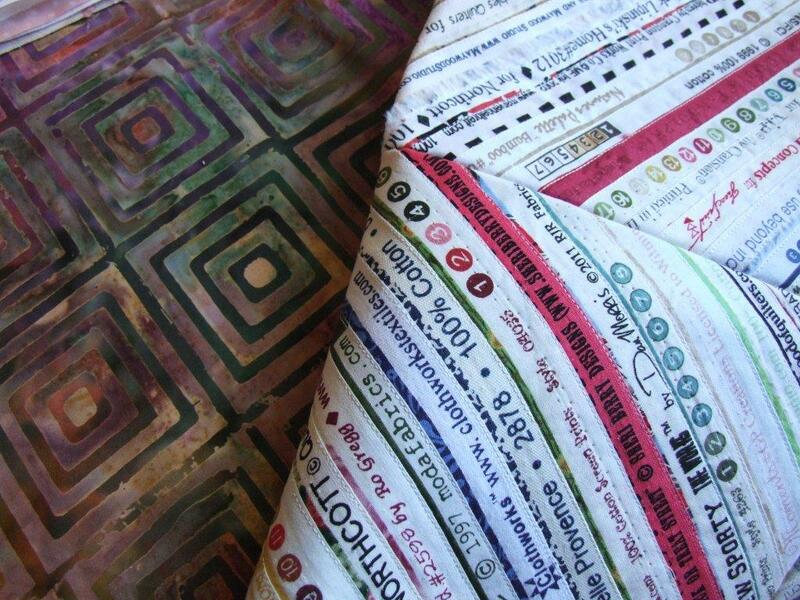 I love it when you can find the perfect fabric right at hand. Now to find a zipper for an inner pocket. If you'd like to make a similar selvedge tote, there's a pattern available on the checkout page of my website. 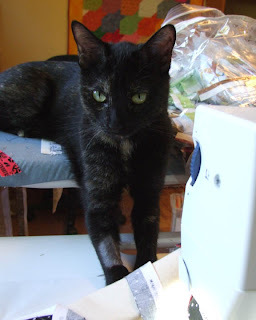 For the first time in what feels like years, Polly and I spent the day at the sewing machine. We had to. We needed to feel the fabric and hear the purr of the machine; most of all we needed the fulfillment of creating something lovely...from nothing . That's magic, you know. Because we chose to work with selvedges, the "nothing" was almost literal in this case. 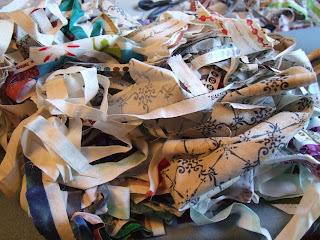 It was such fun to rifle through the basket of selvedges...old friends left from prior projects. Some of the ends are years and years old, so it's nostalgic to remember what was made from each, and from whence each was acquired. Some of the Moda and Kansas Troubles I recognize as coming from Joan. 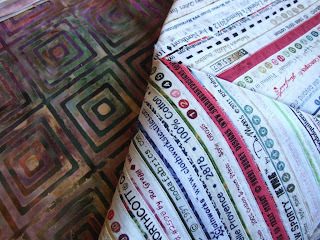 There are a few Darlene Zimmerman fabric edges which were sent by Robin, a reader from Henrico, VA. (Do you still visit, Robin?) 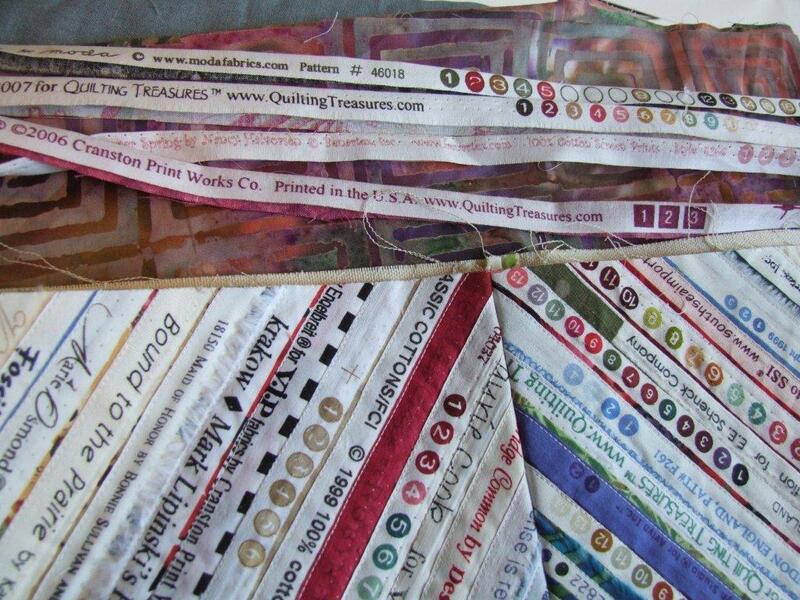 Each of these leftover snippets is unique, as individual manufacturers word their edges to suit their needs. One in particular caught my eye as I stitched it in place. This one from Northcott reads, "Licence is required for any use beyond individual c..." That's where it cut off, at the "c". Naturally I had to go through the pile to find another with the same wording. Consumption. "Licence is required for any use beyond individual consumption". I thought for a bit on how I am consuming the fabric...then I thought even longer about how fabric consumes me...it's a two-way street. Then it dawned on me because Polly and I are both involved in the process - and therefore not individuals being consumed - perhaps Northcott should be required to have a license to work with us... ? Kathy is a wonderful, patient teacher and in high demand; so much so in fact that she was invited to teach in Luxembourg. Wow! I will be taking care of the registration for her class after September 2oth, but in the meantime you can contact Kathy directly for the details.